The successful conduct of an election in Afghanistan provides an interesting counterpoint to Tony Blair’s call for a new intervention in Iraq. This disappointed hopes of the Arab Spring were on show in last week’s one-sided election in Algeria, writes Charles Richardson. Two very different elections in El Salvador and North Korea both signal the triumph of democracy. Must politics always be driven by tribal hatreds, or is there scope for a more constructive way of doing things? The rowdy protests are still boiling in both cities, but are the similarities still there? A slight branding change doesn't mean Greece's Golden Dawn party is changing its values, writes Charles Richardson. French president François Hollande is trying to put the recent crisis in his personal life behind him, but that’s not the source of his political problems. The ongoing protests in Kiev and other cities of western Ukraine are starting to raise the question of whether it can remain a united country. The Spanish region of Catalonia wants to break away to form its own country. It's chances of succeeding are good, writes Charles Richardson. 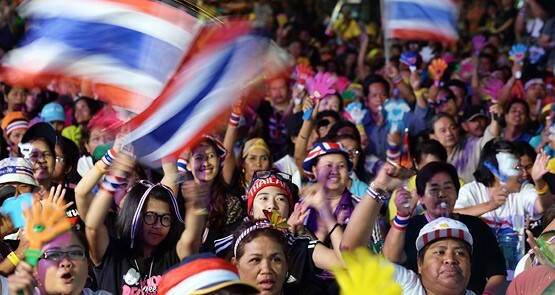 It’s not clear that fresh elections will help resolve matters in Thailand, but at least it’s worth a try, writes Charles Richardson.